IMF bailouts — roads to stability or recipes for disaster? Following the ravages caused by World War II, the International Monetary Fund (IMF) was originally established to allow countries with payment deficits to borrow money temporarily and repay their debt to others. The hope was that this would create financial stability, foster global cooperation, facilitate trade and growth, as well as reduce poverty. Now, more than 74 years later, the debate about the methods used by the IMF to achieve its goals continues to thrive. Proponents of IMF bailout programs claim that the liquidity provided and the reforms demanded are preventing more extreme financial hardship. But the opponents argue that their ingredients make troubled countries more dependent on IMF aid and their populations poorer. Allan Meltzer, a renowned economist at Carnegie Mellon University, who died last year, once said: "IMF's programs drive a large wedge between the social risk — the risk borne by the troubled country — and the private risk borne by bankers." Researchers have found that IMF programs were relatively successful especially in the lenders' early years. Mohisin S. Khan, IMF director for the Middle East and Central Asia, for example, has looked into the bailouts for 69 developing countries during the period of 1973 to 1988. He found that the IMF programs' short- and long-term impacts were largely positive on the countries' current accounts, balance of payment and inflation figures. Among those rated as "IMF success stories," were loan programs for Mexico in the 1980s, as well as for India and Kenya. Read more: Is inequality good or bad for the economy? In response to the Latin American financial crisis in the 1990s, however, the IMF changed its policy, implementing what's become known as "the Washington Consensus" — a policy demanding structural reforms that increased the role of market forces in exchange for immediate financial help. Originally set out by British economist John Williamson in 1989, the principles included lower government borrowing to discourage high fiscal deficits, cuts in government subsidies and lower corporate taxes. Other "structural adjustments" recommended were freely-floating currency exchange rates, free trade policies, relaxing rules that hamper foreign direct investment and competition, as well as the privatization of public assets. The neoliberal economic policies proposed in the Washington Consensus have since become pillars of bailout conditions enforced not only by the IMF, but also by its Washington-based offspring, the World Bank. Joseph Stiglitz, chief economist at the World Bank between 1997 and 2000, had serious doubts about the viability of the new doctrine. Although noting at the time that this policy was appropriate for some Latin American countries, it "didn't make sense to apply it blindly to other countries." Stiglitz also said that although the IMF was funded by money from taxpayers, it was not held accountable to their interests, "which clearly identifies the problem of governance as one of the prime problems with the IMF for taxation without representation." In 1995, Mexico was hailed as a shining example of the IMF's new policy, as the country had repaid a bailout package to the tune of $52 billion (€45 billion). But it would take only a few years that its failures became obvious. Mexico's citizens suffered a sharp decline in real per capita income, which in 1998 had fallen back to a level last seen in 1974. From the end of 1994 to the end of 1996, Mexico added $560 billion to its total external debt because the government bailed out mainly commercial banks to the tune of $545 billion by buying all their bad loans. Some economists even regard the legacy of the bailouts in Latin America as the beginning of the financial crisis in Asia in the late 1990s. They claim that the IMF had sent a clear signal to the world that if anything goes wrong, the lender would come to the rescue of investors. The late 1990s Asian financial crisis was caused in large part by South Korea, Thailand, the Philippines, Malaysia and Indonesia's heavy reliance on short-term foreign loans and openness to hot money. When it became apparent in 1997 that private enterprises would not be able to meet their payment obligations, international currency markets panicked and Asian currencies plummeted. The IMF treated the Asian meltdown like other emergency situations, giving assistance only in exchange for structural adjustment policies. The Fund instructed governments to cut spending, with the result that this deepened the economic slowdown. In South Korea, for example, a country whose income approaches European levels, unemployment skyrocketed from approximately 3 percent to 10 percent. "IMF suicides" became common among workers who had lost their jobs and dignity. In Indonesia, the worst-hit country, poverty rates rose from an official level of 11 percent before the crisis to 40 to 60 percent, and GDP declined by 15 percent in one year. Malaysia stood out as a country that refused IMF assistance and advice. Instead of further opening its economy, Malaysia imposed capital controls, in an effort to eliminate speculative trading in its currency. While the IMF mocked this approach when adopted, the Fund later admitted that it succeeded. Are things looking up in Portugal? Regarding the 2010 sovereign debt crisis in the eurozone, even the IMF's own independent watchdog was hugely critical of the lenders' approach. In a 2016 report, the Independent Evaluation Office (IEO) said the IMF was guilty of "over-optimistic forecasts failed to spot the scale of the problem and left the impression it is treating Europe differently." The crisis, which began in Greece but spread to Ireland, Portugal, Spain and Cyprus, brought the 19-member currency union to the brink of collapse and enormous hardship to the people. Despite three bailouts totaling €298 billion, unemployment in Greece, for example, remains stubbornly high at 22.5 percent. There, the minimum wage has fallen from €863 to €684, while government spending on health almost halved. But Greece's creditors from the IMF and the European Union continue to demand that Athens spends less than it earns, in order to create the surpluses needed to repay its debt. In recent months, the number of finance ministry officials from across the world meeting IMF representatives in Washington seems to have grown significantly. More and more money is pouring out of developing nations and into the United States, causing the US dollar to rise in value and the currencies of emerging markets to hit new lows. Their US dollar-denominated debts have become huge burdens. Turkey has been at the center of the rout, but many other countries, including Argentina, Hungary, Egypt, Angola, Ukraine and Indonesia, have been hit as investors dump riskier emerging market stocks and bonds for the safety of American assets. Argentina's Economy Minister, for example, is in Washington this week to thrash out a hastily revised loan deal with the IMF under efforts to shore up investor confidence and the peso, which plunged 20 percent alone at the end of last week. But the IMF is confident that the austerity measures imposed by the government on the lenders' advice — including cuts to energy subsidies and the loss of 95,000 public sector jobs — will stem the tide. Turkey, meanwhile, is trying to weather the storm in emerging market finance, despite a 40 percent drop in the value of its currency, the lira. Ankara says it won't go cap in hand to the IMF begging for a bailout that will only cause its population to suffer more. Judgement is still out on which country will overcome its crisis better. Argentinian President Macri had promised to end poverty, but his country is now experiencing an economic crisis. Macri says former President Cristina de Kirchner is to blame for the state of the economy. He has asked the International Monetary Fund to step in. But the IMF bailout came with some tough conditions - austerity measures. Poverty is now rising in the country. 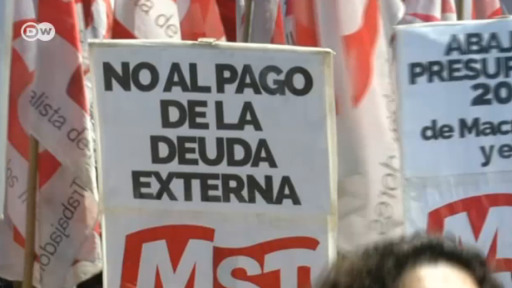 Parliament in Buenos Aires is set to vote on an austerity budget as part of its bailout deal with the IMF. To qualify for the 50-billion-dollar rescue package, the country has to raise taxes and cut social programs. That's painful for many citizens, and protests are ongoing. Eight years ago Greece was on the brink of bankruptcy. The EU and IMF agreed to bailout Greece to the tune of 300 billion euros in exchange for tough austerity measures. During the week, Greece formally ended its bailout program. That means it no longer depends on international aid funds. Keith Walker speaks to Adriano Bosoni, Senior Europe Analyst at geopolitical intelligence firm Stratfor.com.